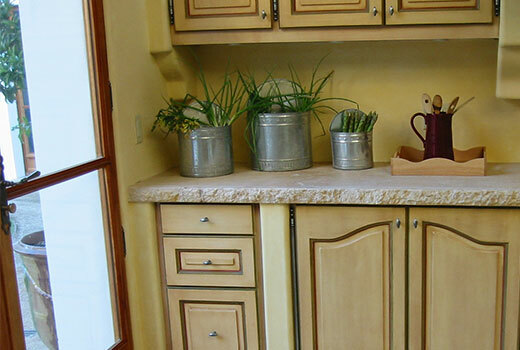 Limestone countertops create an elegant atmosphere for your home. With the wide variety of limestone, you can match the interior design of the room that also fits with your lifestyle. With natural European limestone and state of the art tools, we provide the highest quality limestone countertop services. All of our limestone is imported from France and Italy. Discover the beauty and sophistication of our natural limestone countertops. Learn more about our services here. Limestone countertops are a wonderful choice if you are looking for natural stone material that is both durable and visually striking. If you want to customize your counters to match your kitchen color scheme, we have a great variety of colors and styles. Limestone will give your home the sophisticated, European look that you desire. We are passionate about crafting impressive custom home features that you and your family will love. With our years of experience, dedicated artisans who are trained in traditional French carving, and our superior tools, we proudly design and build astounding pieces of architecture that will last a lifetime. Our number one priority is your ultimate satisfaction, so we are more than happy to work closely with you to help you achieve your dream project. Elevate your home’s aesthetics with our one of kind natural European limestone. Contact us today to learn more about our services or schedule a consultation to get started on your dream project.